I know what you’re thinking. Just reading the title is throwing you off, I bet. This is not a guest post. My blog hasn’t been taken over by a health nut, either. I also made a promise to myself this year that I would really try to eat better, since Mr. Crumby and I are trying to start our family. I’ve done an OK job in that area, but my gym attendance has gone down to zero since our trip to Europe in February. I knew after going back to work from that vacation that it would be hard for me to squeeze in workout time, and I promised Lara that I’d be back after Easter…but I just keep making excuses not to go. I have been taking long walks/jogs with Vader, and throw a P90X yoga session in here and there to de-stress, but otherwise, my routine has been eat-sleep-work-bake-blog. Needless to say, I’m not in the best shape of my life. 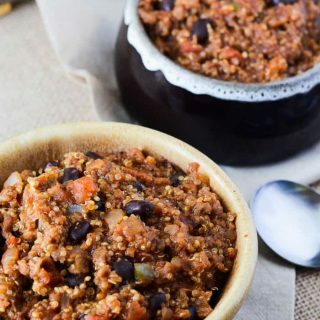 But, I can happily say that I’m at least maintaining my weight, thanks to dinners like my Mushroom Spinach Chickpea Burger, Sweet Potato Noodle Alfredo, and this One Pan Vegan Quinoa Chili. I’ve learned a lot from my Healthy Fit Foodie in the years we’ve been friends and workout buddies. Imagine it. She went to school to become a dietitian and personal trainer. I get for free what she gets paid for by everyone else. 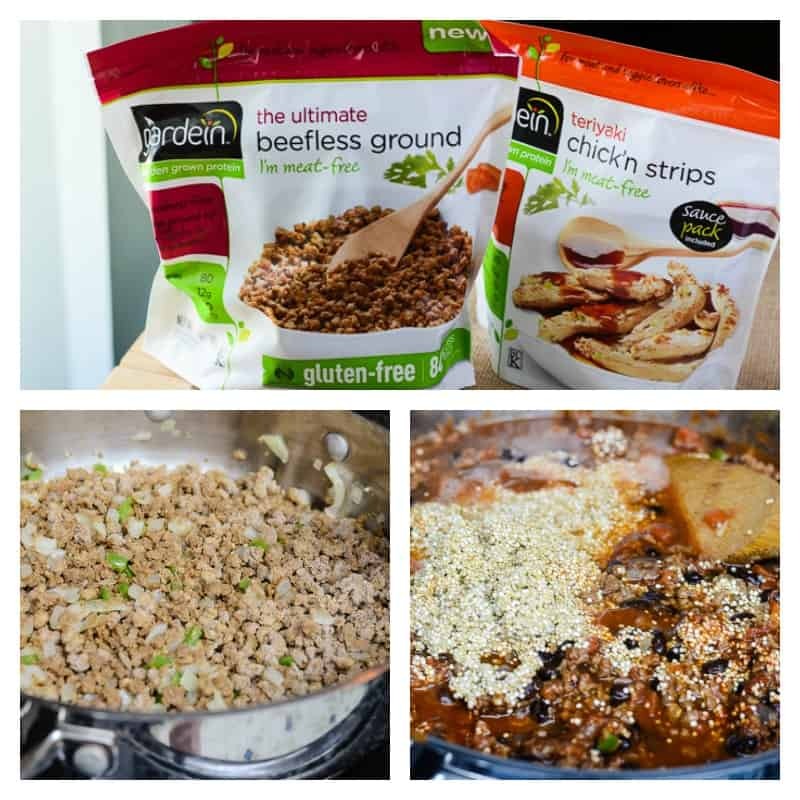 She also told me about this great brand of frozen, meatless, plant-based protein called Gardein, and recommended that I #MeetChef and give it a try. I found a great $1.00 off coupon, and saving money is a great way to convince me to try something new, so I figured it was worth a shot. When we were actual active gym rats, she was constantly giving me recipe ideas for things to eat post-workout that were full of protein, to help my muscles recover from the lifting we’d spent an hour 3 days a week doing. There’s only so many protein shakes, peanut butter sandwiches, and tuna wraps a woman can take, you know? Before Gardein, I thought all soy-based meat substitutes tasted like nothing but mush. Buuuuuuuut I’m wrong a lot. As it turns out, this Ultimate Beefless Ground is almost indistinguishable from ground beef! The texture is very similar, and if you’re a carnivore that still needs convincing – you could always add beef broth to satisfy your need for beef flavoring. I actually think I could get away with subbing out some of Mr. Crumby’s favorite ground round with this stuff, and he’d never be able to tell. I have to help keep him on the straight and narrow path of healthy food, too, otherwise, he’ll never be able to keep up with our future babies! 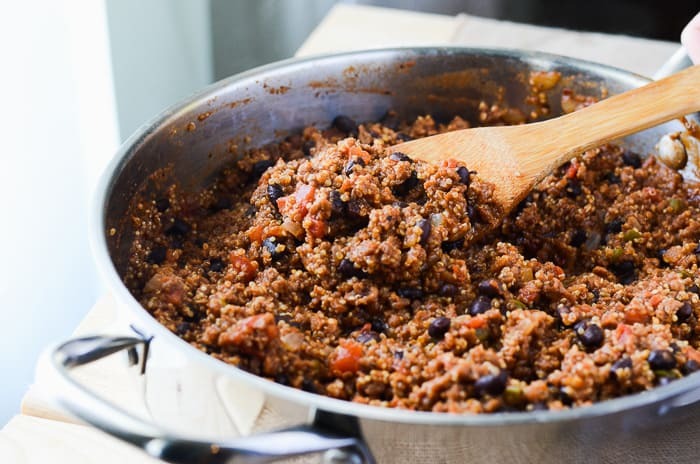 This beefless ground is so much healthier than regular ground beef. Let’s start with the fact that it’s totally heart-healthy, with absolutely no cholesterol. It’s gluten-free, full of protein, fiber, & iron, and has fewer calories and 84% less fat. Plus, the fact that it’s made with non-GMO soy and wheat, grains, & veggies, and that eating it once a week reduces my carbon footprint makes me smile. In fact, if every American ate meatless just 1 day a week all year, it would be the equivalent of taking ½ million cars off the road. 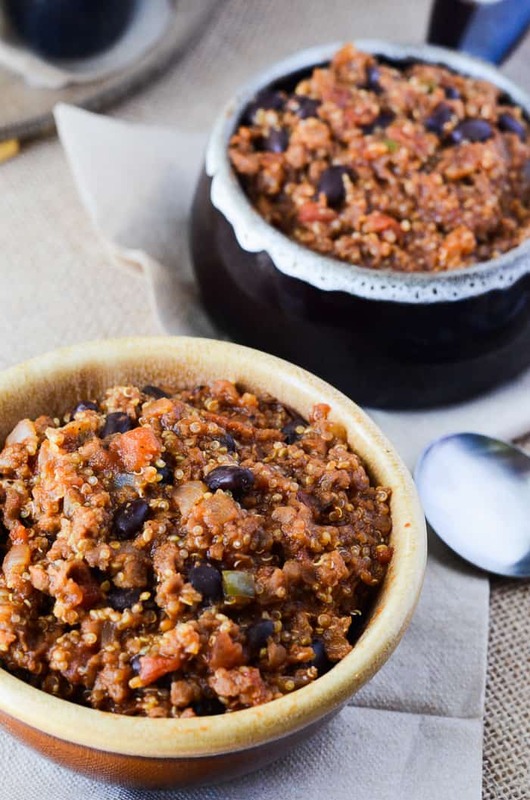 And believe me when I say, not only was this totally vegan quinoa chili quick & easy to make (45 minutes in one pan ain’t too shabby), it was freakin’ delicious. It turns out you can eat a flavorful meal, even without meat! I even felt good about eating it; it was like my brain and my body both knew I was doing them a favor. If you’re anything at all like me, and are looking for a better way to balance out your diet, or if you have medical problems that are causing you to change your way of eating, give Gardein a try. They make a good variety of products that are available at 22,000 retailers nationwide, so you’ll most likely find exactly what you’re looking for, no matter which grocery store you visit. You won’t regret it, your body will love you for it, and the planet will shine a little bit brighter in thanks. Saute onion, garlic, and jalapeno for 3-4 minutes, until onions begin to become translucent and garlic is super fragrant. Be sure to stir often to avoid sticking. Add in the Gardein Beefless Ground, breaking up any chunks and stirring to distribute the onion mixture. Cook for another 4 minutes or so. Add the black beans, tomatoes, paste, and ¾ cup of the vegetable broth. Stir to thin tomato paste, and combine all ingredients evenly. Stir in remaining broth and rinsed quinoa, distributing all ingredients in the pan evenly. Season to taste with Italian seasoning, pepper flakes, salt, & pepper. Add more broth if you feel it's a bit dry - the quinoa needs plenty of liquid. Bring everything to a boil for one minute, then cover pan and reduce heat to low, and simmer for about 15-20 minutes, or until quinoa is done cooking. 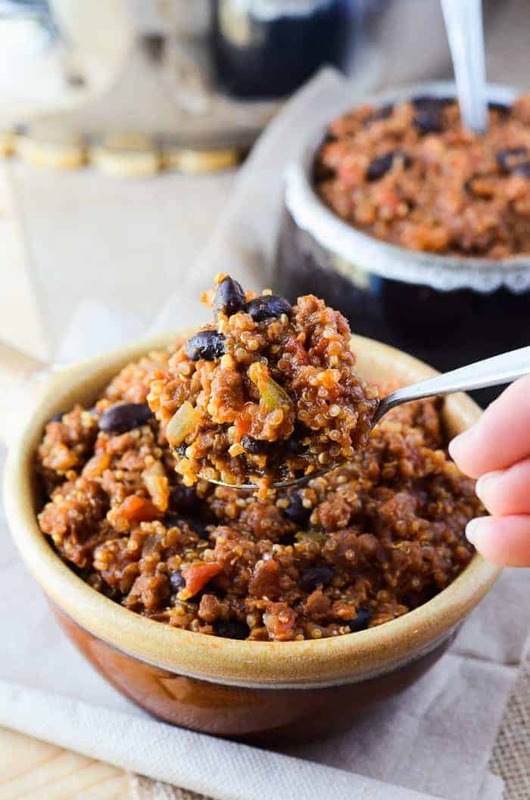 Serve as is, or top with your favorite chili toppings - dairy free cheese, yogurt, or crumbled crackers. Enjoy! 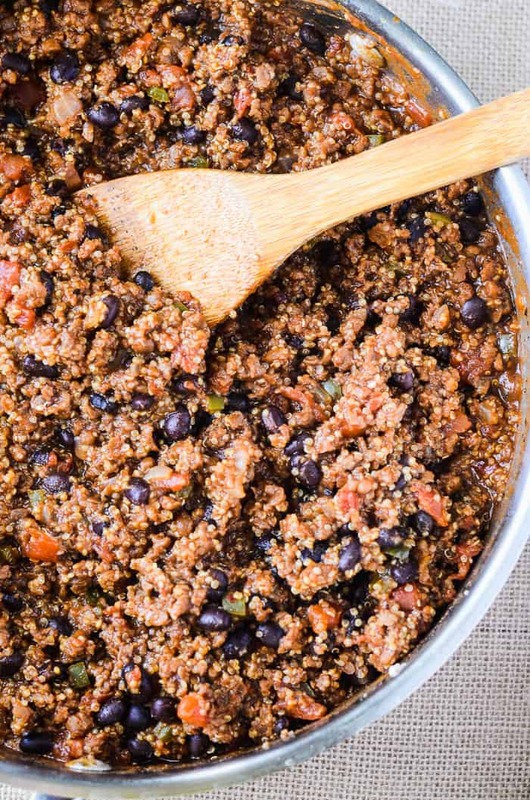 I have never tried quinoa, but I’ve seen so many great recipes. This chili is going to push me over the limit. I really need to try it. This looks really good. I like quinoa. This looks delicious! I’m a little leery of quinoa but this looks pretty tasty! Pinning to try it myself! This looks really delicious! I think that I would give this a try. I’m always up for giving something new a try. I am a huge fan of Gardein! I LOVE their products – you have to try the chicken tenders! They taste so much better to me than chicken nuggets and are much healthier. This chili looks delicious! Oh YUM, that chili looks amazing! 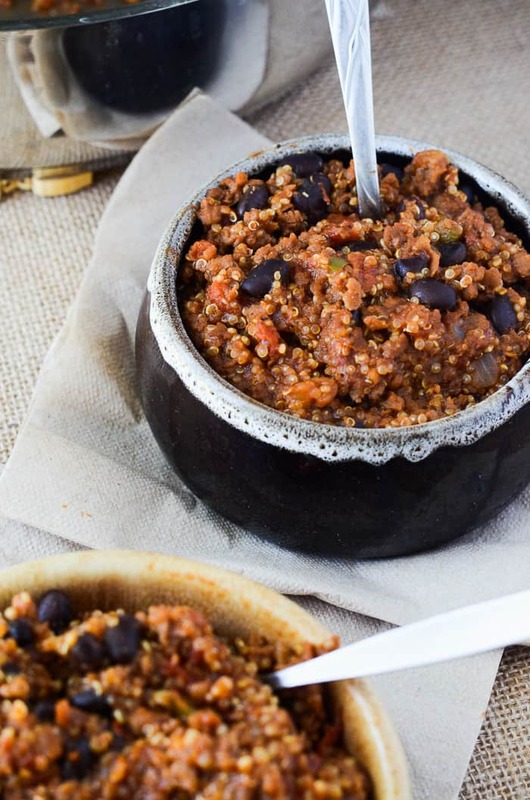 I love chili so much but have never tried with either quinoa or Gardein… now on the list! This is my kind of dish and I have a huge bag of quinoa just sitting in my pantry. I will need to see if they sell this at my store. I’d love to do a taste test to see if I could tell the difference! I love me some meat, but I know having a vegetarian night during the week appeals to all of my family members! 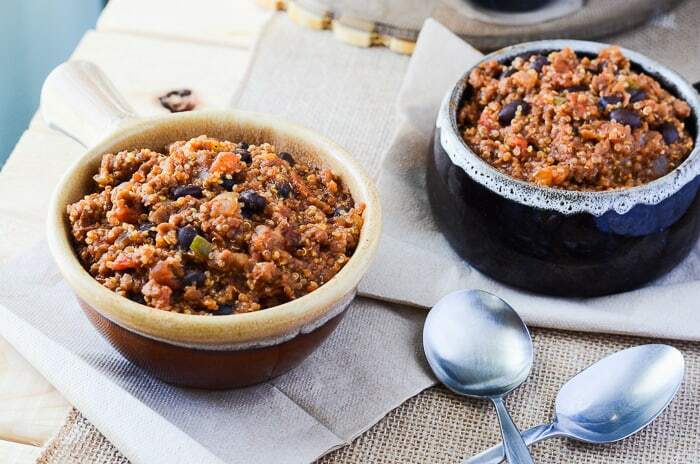 I’ve never tried quinoa chili before. Definitely in my bucket list now! Oops, sorry! I meant to give you a 5 star!!! This looks very healthy and delicious Erica Pinned and shared! What size can of tomato paste? The small cam or regular 15oz can? I made this once before and it turned out awesome, but I can’t remember what I decided to use and the recipe doesn’t specify. Thanks. This sounds so good! I am sharing this on pinterest.